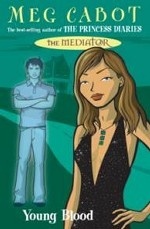 Аннотация к книге "The Mediator 4: Young Blood"
Suze should be spending the summer vacation at the beach. Instead she`s been forced to get a babysitting job at a swanky resort. She`d expected to look after some boring brat, so Suze is surprised to find that her charge is actually a budding mediator – with a totally hot older brother. Not that Suze`s head could be turned by some guy – she`s pledged her heart to Jesse, the most gorgeous ghost ever. But it`s tough when the boy you love doesn`t seem to love you back, and it`s even tougher when you think you`ve found his 150-year-old grave in your backyard. Suze knows it`s dangerous to dig up the past, but how can she focus on babysitting when she could be close to discovering who killed Jesse?